Istanbul Carpet Week ran from 6-8 October 2016 in the historic city of Istanbul, Turkey. Hosted by the İstanbul Halı İhracatçıları Birliği (IHIB), that’s the ‘Istanbul Carpet Exporter’s Association’ in english, the week – which was in truth a truncated week – coincided with IHIB’s annual Gala and the 10th Annual National Carpet Design Awards and further offered delegates the first ‘Istanbul International Carpet Conference’, purchasing opportunities, and a peek into Turkish design and culture. Michael Christie of The Ruggist, of course, and Birgit Krah of Reuber Henning, natürlich, awaiting the start of the Istanbul International Carpet Conference along with other attendees. Reza Ashtari of Ashtari Carpets can be seen far right. | Image courtesy of Istanbul Carpet Week. Of foremost mention for those of you seriously interested in rugs and carpets is the Istanbul International Carpet Conference and as I write that I know what you are thinking. ‘Dear God(s)! A conference? Is he nuts? Zzzzzzzzzz’ Perhaps I am, but that is a story for another day. As someone who has long favoured a more educated consumer/dealer, the conference offered insight across a variety of topics, some more interesting to me than others, and served to broaden my carpet horizons. It was a rare delight to see an organization such as IHIB, whose purpose is to promote the sale and export of Turkish made wares, organize an event where education played such a prominent and important role. In doing so, the gap was bridged between classicists such as Dr. Hadi Maktabi whose presentation focused on the more esoteric (to modern consumers) Azerbaijani Rugs and, dare I say modernists, such as Carol Sebert of Creative Matters who presented on her success as a contemporary designer working across a variety of carpet media. 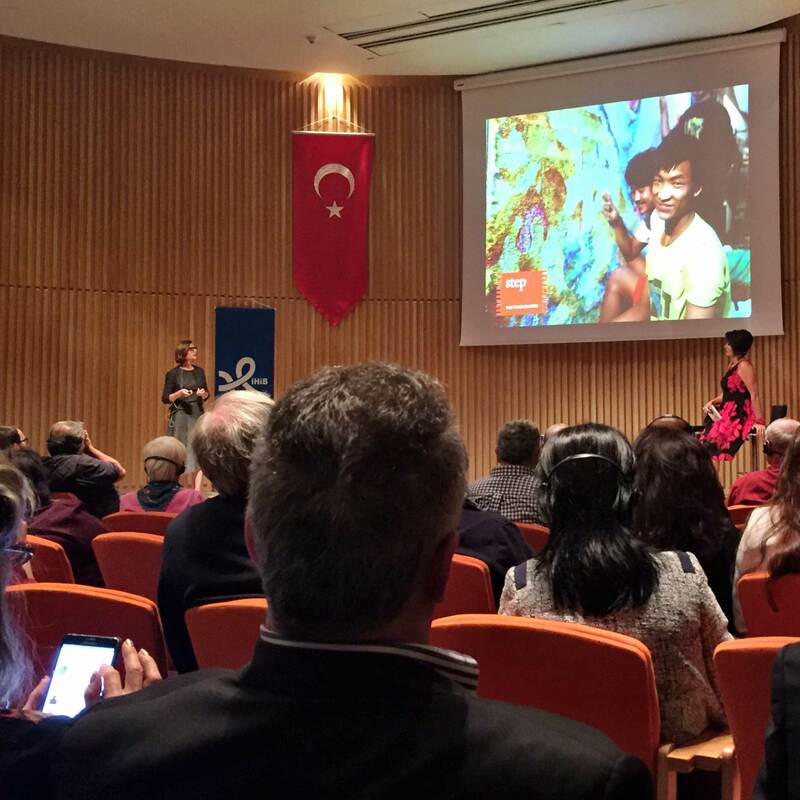 Carol Sebert of Creative Matters is shown speaking about LabelSTEP during her presentation ‘Contemporary Carpet Design’ during the Istanbul International Carpet Conference, 6 October 2016. | Image courtesy of The Ruggist. Stefano Ionescu spoke eloquently and passionately about 16th to 18th century Western Anatolian carpets which through trade had made their way from the Ottoman Empire into Transylvania ultimately coming to reside as hangings in the ecclesiastical buildings thereof. These so-called ‘Transylvanian’ carpets represent the largest and best preserved repository of rugs of this caliber outside of the Islamic world and provide a look into the methods and style of the past, unaltered by intervening years of wear or repair. Other presentations including those by Udo Hirsch – ‘The Motifs of Anatolian Cult Kilims’, Professor Dr. Hamdİ Ünal – ‘Innovation in Hereke Carpets’, and the award winning Erbil Tezcan of Wool and Silk – ‘Interpreter versus Designer’ offered further insight into subject matter delegates as a collective might usually shy away from. The final presentation, by United States’ carpet dealer Rob Leahy of Fine Rugs of Charleston, scrutinized the changing American marketplace and its role/influence in global carpet trade and production. The conference concluded with a provided lunch and then transitioned to business to business meetings in an adjoining conference hall. 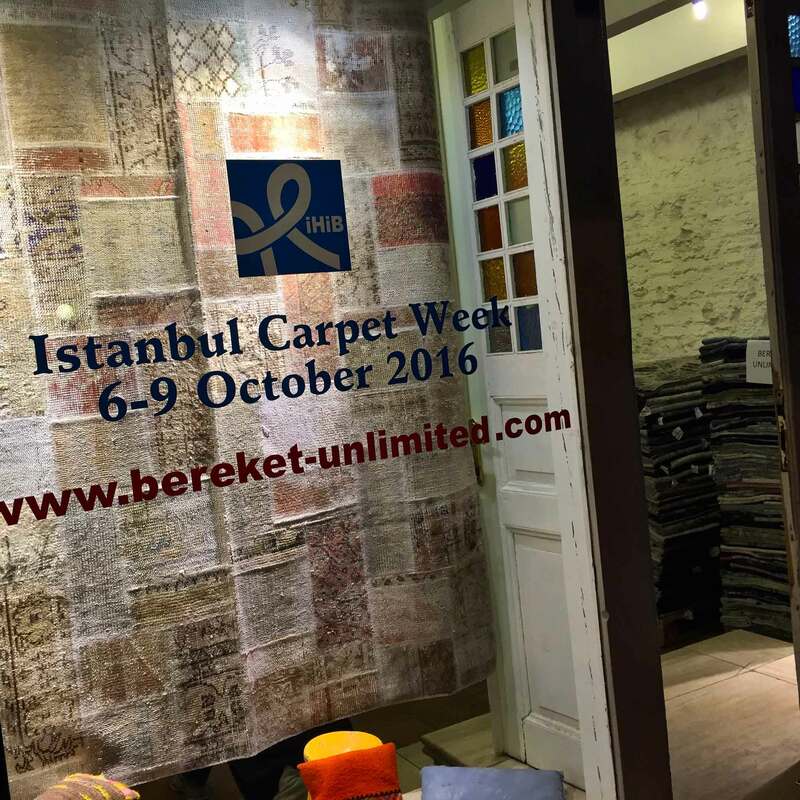 Bereket Unlimited in Sultanahmet, Istanbul, Turkey welcome attendees and delegates during the inagural Istanbul Carpet Week. | Image by The Ruggist. Delegates and attendees seemed to enjoy the business to business meetings at the conference though given the structure and the compactness – each exhibitor having only a small table/booth – it was difficult to gauge an individual company’s product fully. However, and herein is another part of the success of this event, day two (2) offered those in attendance the ability to travel around Istanbul calling upon dealers and makers directly at their respective shops. Instead of seeing only a glimpse as it were, buyers could choose from a firm’s entire selection. This is of course a great opportunity rarely found at large(r) trade shows and is akin to past efforts such as the New York International Carpet Show (NYICS) and Metro Market Week during their early peak years; individual dealers co-operating instead of competing per se. 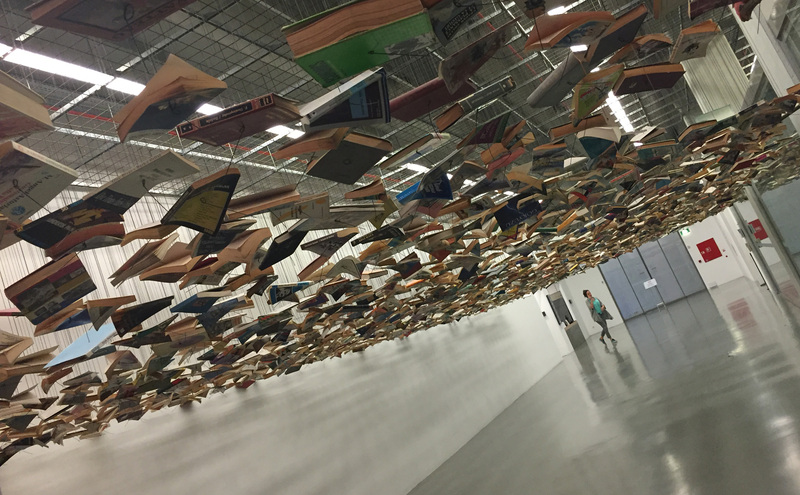 The ceiling treatment in the hallway outside the library at Istanbul Modern. | Image by The Ruggist. Istanbul however is more than just carpets. It is a cultural crossroads built literally layer upon layer on civilizations past. For some of the luminaries in attendance it was their first time in such a storied city, while for others it was homecoming. For me, it was an opportunity to look more closely into a culture I knew only from afar, through books, and more recently through dispairing news reports; the last of which discouraged more than one potential delegate and a tentative speaker from attending I must add. When asked by Chirine Maktabi of Iwan Maktabi: ‘What are you going to do tomorrow before the Gala?’ in reference to free time we had in our schedule – of which there was ample – I responded: ‘I’m going to Istanbul Modern!’, the contemporary art museum in Istanbul. Though I did tour the historic sites of Istanbul extensively thanks to our hotels’ proximal location in Sultanahmet, I wanted to see Istanbul not for what it once was, but for what it is today: the culmination of cultures past and present. Hence my visit to Istanbul Modern which I highly recomend. 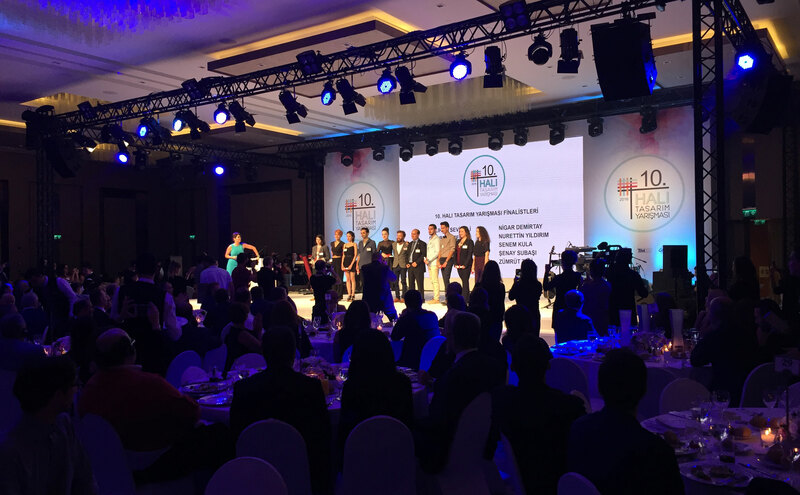 The finalists of the National Carpet Design Competition assembled during the IHIB Gala on Friday, 7 October 2016. | Image by The Ruggist. I did however call upon a few choice dealers including Kirkit, the shop of IHIB’s Vice-President Ahmet Diler (more on this later), to view his firm’s work which attracted several buyers from both the United States and Europe. Their linen flatweaves – either block printed or plain – have a degree of understated luxury, while their modern wool kilims designed by frenchwoman Florence Bourel bring an updated aesthetic well suited to contemporary homes. In fact, Kirkit’s Dalga Kilims Collection was a finalist at the 2017 Carpet Design Awards at Domotex and so it would seem Istanbul Carpet Week provided an opportunity for savvy keen-eyed buyers to be well ahead of the curve. The evening of the second day was filled with IHIB’s Annual Gala as well as the judging and presentation of the 10th Annual National Carpet Design Awards. Without tedious commentary, I’ll say much the same for this event as for the entire week: It was organized more or less flawlessly and was a true delight. Muhammed Türk won the design competition with his carpet based on the theme of ‘destruction’ and has now gone on to design carpets for the aforementioned Kirkit which were shown at Domotex 2017 as well. 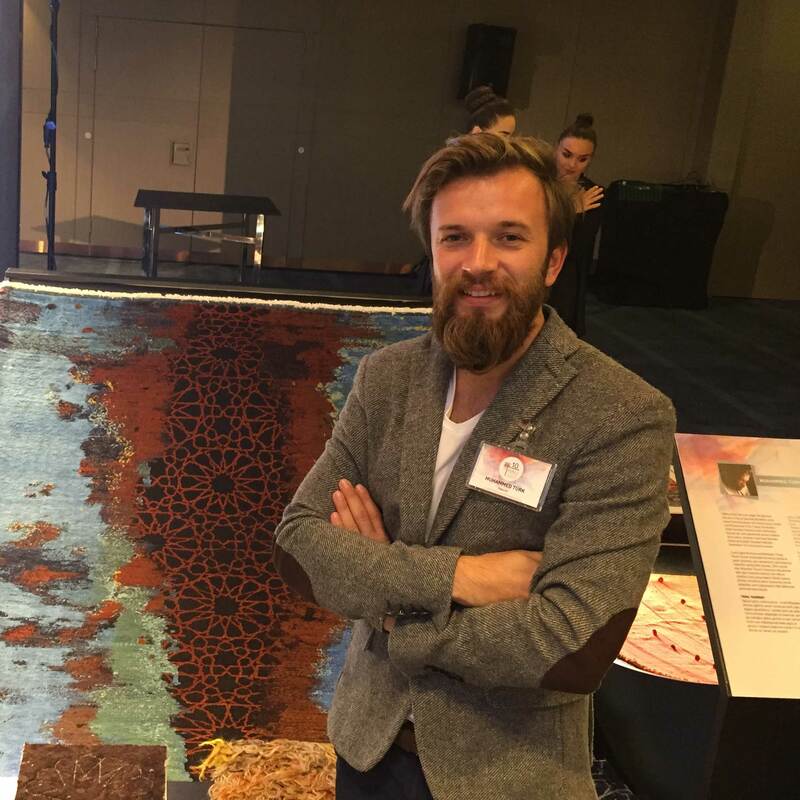 Muhammed Türk won the 10th Annual National Carpet Design Award presented by IHIB. His design based on the theme ‘Destruction’ was widely regarded as ‘highly sellable’ by everyone we spoke with. | Image by The Ruggist. The final day of the week was presented as either free time or one could opt for a guided tour of various historic sights in and around old-city Istanbul including the world renown Topkapi Palace – formerly home to a long series of Ottoman Sultans and their various and potentially scheming Grand Viziers. Aside from the educational aspect of the tour, it also allowed rug dealers from disparate geographies and cultures to socialize in a casual atmosphere thus building connections and bridging those gaps which foolishly keep us apart. Plus, as a newfound friend of Turkish Coffee, one does not simple pass on the chance to sip a cup with three charming friends from Beirut, Canada, and Germany while overlooking the Bosphorus and the Sea of Marmara. What are we, uncivilized? I think not. 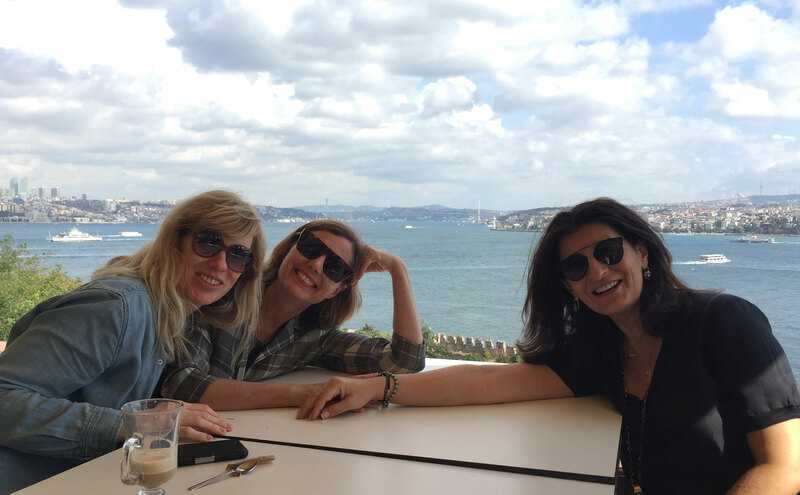 Birgit Krah of Reuber Henning (left), Carol Sebert of Creative Matters (centre), and Chirine Maktabi of IWAN MAKTABI (right) shown enjoying coffee during a tour of the Topkapi Palace. | Image by The Ruggist. Istanbul Carpet Week and its various events were a huge unqualified success. Information was exchanged, rugs and carpets were sold, and I know at least one US based rug dealer stayed on a few more days to purchase new carpet cleaning equipment. The experience of learning about Turkish rugs and culture and the history of Anatolian rug making, in situ as it were, is perhaps the best way to comprehend fully the nature of the product. Doing so when everyone in attendance is a ‘luminary‘ of sorts as Carol Sebert would describe it, is unmatched by most contemporaneous efforts to sell carpets and for that alone IHIB deserves praise. One final note of excellence: The presentations during the Istanbul International Carpet Conference are summarized and available for reading in IHIB’s annual publication ‘Alive’ which only serves to reinforce my belief in shared as opposed to proprietary information. The second annual Istanbul Carpet Week is scheduled to take place 1-4 October 2017 and I consider it a ‘must’ should your schedule permit. More information can be found by visiting IHIB’s website. Disclosure: The Ruggist participated in Istanbul Carpet Week as a guest of IHIB with organizational assistance provided by Hali Publications. Like many of the delegates and attendees my airfare, accommodations, and tour costs were covered by IHIB.